Laughing Out Loud at U (you). He has a better chance of being given the SA treatment than Passel Argente. ooo...ouch. now THAT was personal. don't diss passel, please. Can't wait for this figure. sorry to be one of the few dissenting votes on this figure, but don't like it. Repainting it and putting a pauldron on it just doesn't cut it for me. If that's the case I already have 3. Just pop off head, put on pauldron from Clone Commander on an SA #41, buy a paint vile for like $1.35, a paint brush.......and presto change-o! You have an APPO! Sorry guys, I'm passing on this one! Cody will warm, no kids want a holo figure. The only appeal of this figure is from us. "Just pop off head, put on pauldron from Clone Commander (5.99) on an SA #41,(5.99) buy a paint vile for like $1.35, a paint brush (2.00).......and presto change-o! You have an APPO!" for only...about 15.00! Around here Saga figures come out to about $7 each. On topic I'll buy a few. I like the #41 better than #6 anyways. oh, more than that. where can you get a figure for $5.99 anymore, let alone a clone! i still cant wait for this appo! Wow! People are touchy with making some effort. Welllllllllllllllllll. Since this is the COLLECTIBLES SECTION, I assumed people COLLECTED figures and would already have an SA 41 and a Commander. Didn't realize collecting meant you have a HISSY FIT over a suggestion. Come on, seriously, no one has these figures to fiddle around with? Smile. You'll feel better. Take a deeeeeeeep breath! 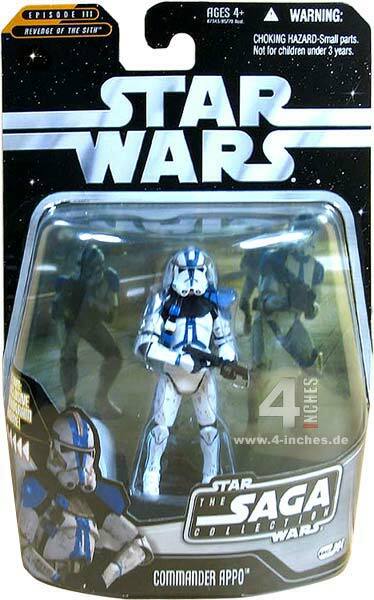 id buy one just for the fact that i cant find many clones around here anyways. probably wouldnt find this one though either lol.